The pony brawl to end them all! Katie Cook and Andy Price\ have completely delighted me with this ongoing comic book series. They’ve done more than just channel the fun and good will of the animated series through this serial; they’ve taken established stories and characters and have spun a very enjoyable story to a new format. 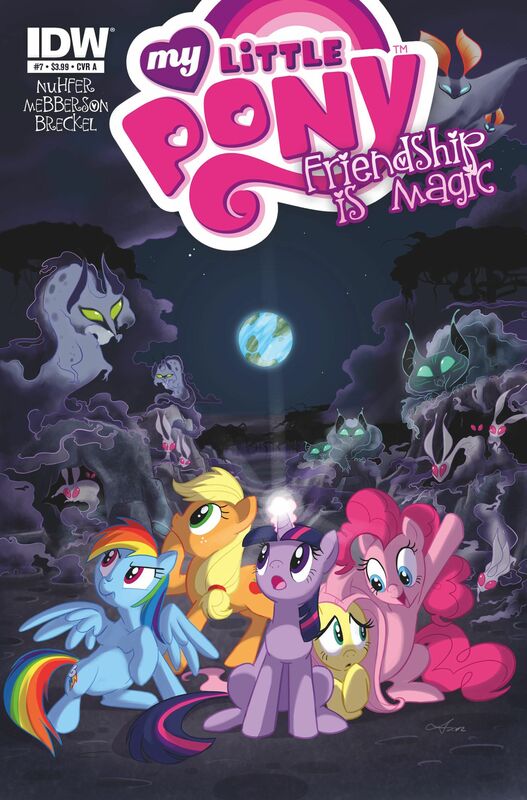 For fans of the animated series or comic book readers looking for an all ages title that goes above and beyond the call, My Little Pony: Friendship of Magic is well worth a look. As the fourth and final part of “The Return of Queen Chrysalis,” Twilight and her band of merry ponies march into the castle of the Queen to save the Cutie Mark Crusaders from the clutches of the changeling kingdom. 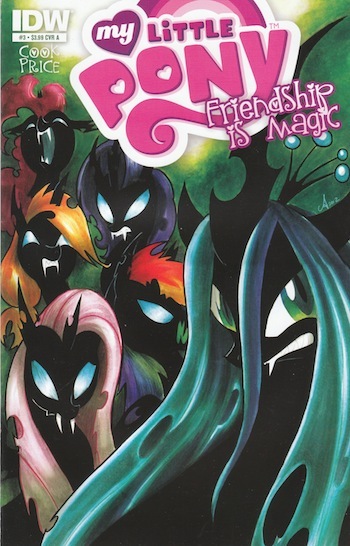 Meanwhile, the magic enhancing Secretariat Comet is fast approaching, Queen Chrysalis springs her final trap, and a battle building since part two of “A Canterlot Wedding” finally comes to fruition. Katie Cook has proven since issue one that she just gets these characters. Everypony sounds true to their animated counterparts, and Cook has done especially well with Queen Chrysalis and the Cutie Mark Crusaders. The Queen just exudes a charisma and personality that’s just too good to resist. The way she toys with Twilight and company is just funny to watch and read, making her one of the best elements of this whole arc. Meanwhile Apple Bloom, Sweetie Bell and Scootaloo are all handled remarkably well. Their constant banter has been pretty funny, and the fact that they can drive even Queen Chrysalis to near insanity is a testament to their enduring nature. Once again, Andy Price and colorist Heather Breckel completely knock it out of the park in what is undoubtably the best looking issue so far. This issue is much darker than previous issues, but the colors are still vibrant. While the animated look is still intact, it’s the more striking and serious moments that stand out with excellent lighting, an insane amount of detail, and nice little visual touches that help make each panel feel like scenes rather than snapshots. One particular scene features a flash of lightning, causing Rainbow Dash, Applejack, and Rarity to protect Scootaloo, Apple Bloom and Sweetie Belle, respectively. The scene is memorable to me because each pony protects their filly in a different way: Dash flies Scootaloo to safety, AJ covers Apple Bloom using her whole body, and Rarity engulfs Sweetie Bell in her arms. Visual scenes like this are sprinkled throughout the whole issue, and it just gives the comic so much weight and charm. It’s easy to find something new if you read it again. 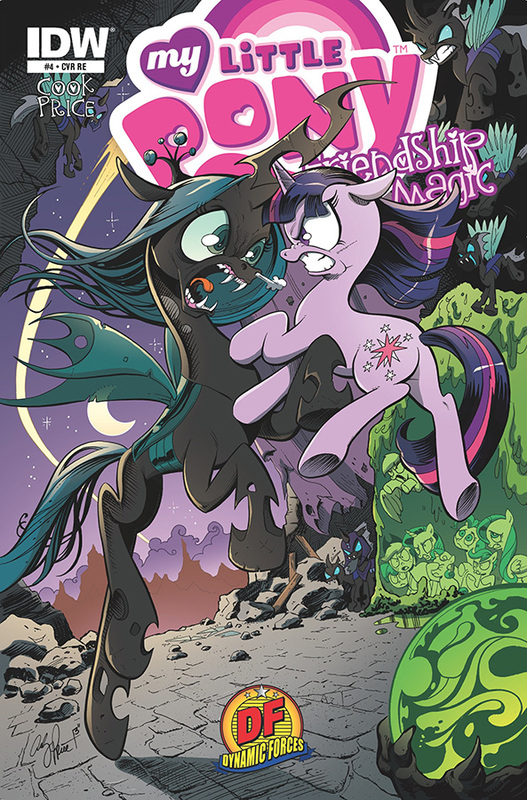 The highlight of the book is the visually spectacular battle between Twilight and Chrysalis, which just blew me away. 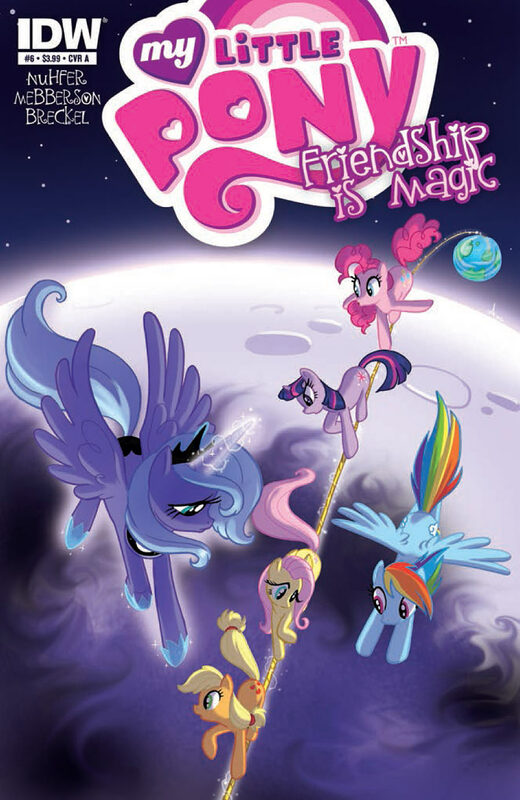 It’s probably the most intense battle in Friendship is Magic, and that’s counting the cartoon. If there is one flaw with this issue, it’s that the battle feels is a little uneven. Without giving anything away, it’s a great one on one fight, but one that feels a little too short. This issue closes out an amazing first arc to a great new comic book series. 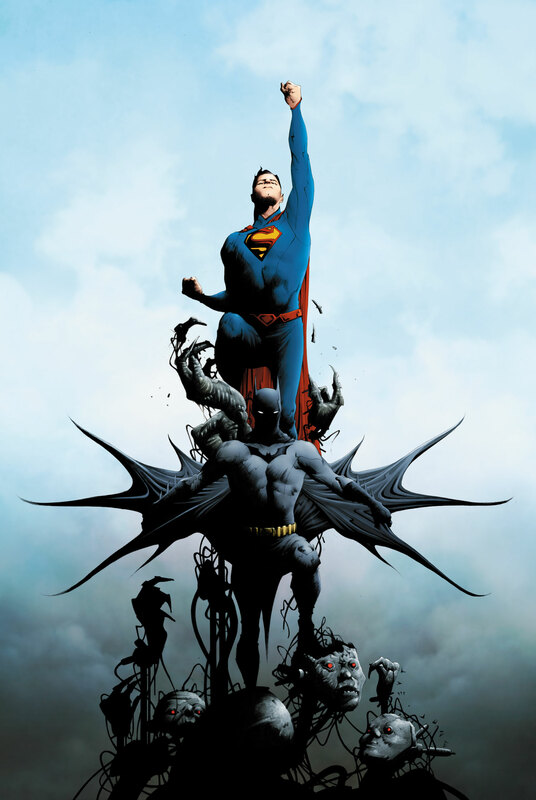 It also marks the (hopefully temporary) departure of writer and artist as a new duo will helm the next story arc. Even so, this was a great way to open a comic book based on such a beloved property. 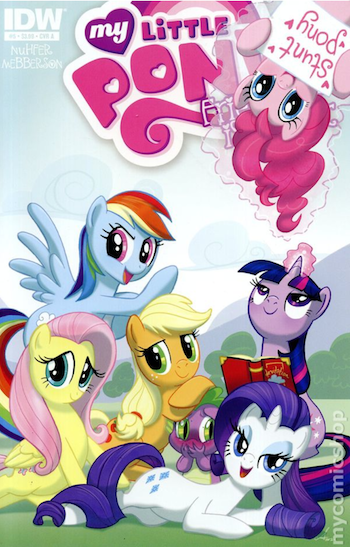 It introduces everyone’s favorite ponies to a whole new audience and entertainment format. 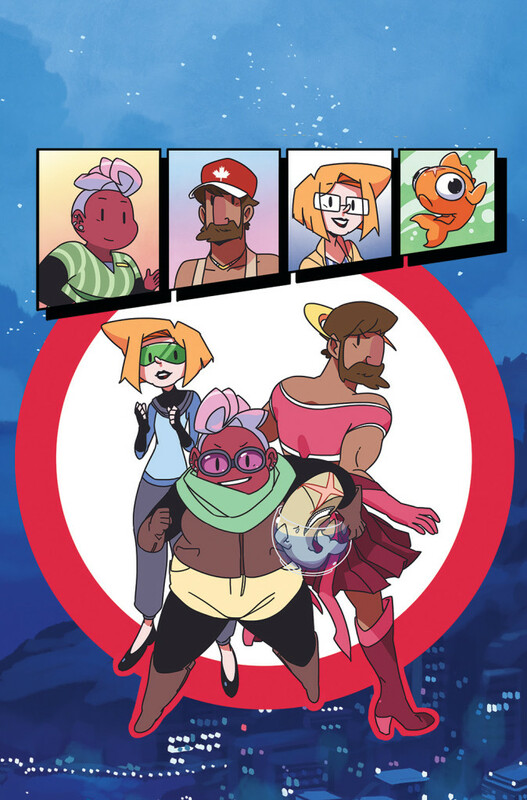 This comic has been a lot of fun, and I can’t wait to read more!